I am not completely convinced I don’t have some sort of disease. I can’t seem to make it through the month of February without getting an irritating itch to plant something. While at the grocery store a few weeks ago I found this beautiful blue hydrangea just screaming at me to bring it home. 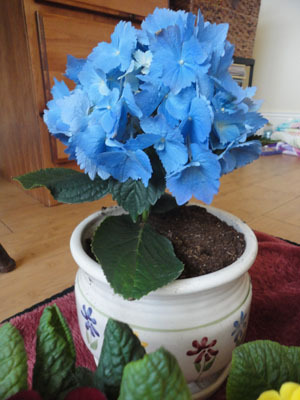 I have a unique draw to blue hydrangeas, maybe because I can’t successfully grow one in my yard and my large potted one is barely holding on to dear life inside the barn. I just had to have it! 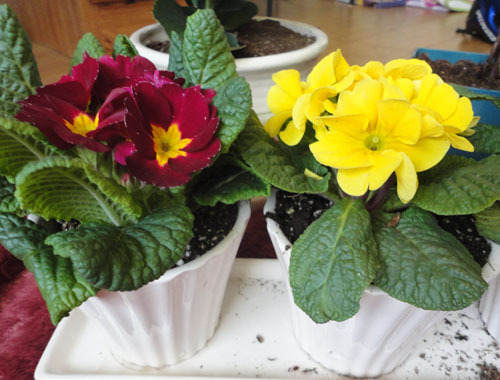 Then, while at Home Depot buying a nice pot for my new hydrangea friend I noticed a table full of primroses. I had to have them too. Planting is one of my most favorite things to do with my kids. My daughter J5 loves to plant and water and watch things grow. After using a small bag of potting mix and making a large mess on the office floor J5 and I had a new collection of plants for the plant shelf. 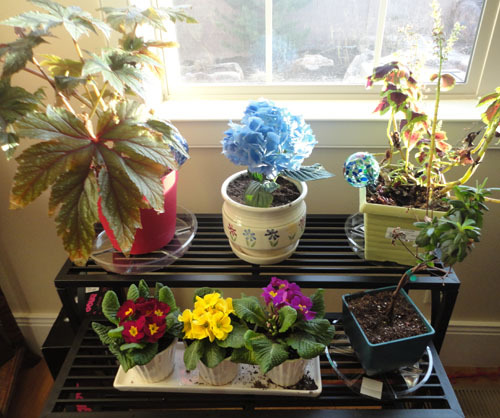 Although I am relatively new to growing plants inside the house I am quite pleased with the success of my planting efforts from LAST February; everything is still alive (theOrchid is my favorite)! I have also managed to keep the breath in some of my shade plants from last summer, although they could be doing better. My biggest problem is sunlight. I have about 11 south facing windows in my house but a good portion of them are covered by a deck and the others just don’t have much room for plants in front of them. I did, however, decide to do some furniture rearranging to place a three tiered plant shelf in my office so I am looking forward to improved success. Notice I still have plenty of room on my new shelf…. Time to do a bit more shopping! For many years I assumed I was incapable of growing houseplants; you may feel the same. If this is an avenue you’d like to give another shot (or if you are looking to start for the first time) there are a few things to consider. And no, none of these items have any relationship to your genetic capabilities or the color of your thumb. Light – This is by far the biggest issue when growing ANYTHING (indoors or out). Houseplants need sunlight to produce food, just like the tomatoes in the garden. Some houseplants, especially those with green foliage, will do fine with a moderate amount of indirect sunlight. A few plants, such as a Chinese evergreen and a cast-iron plant will thrive in very low amounts of light. 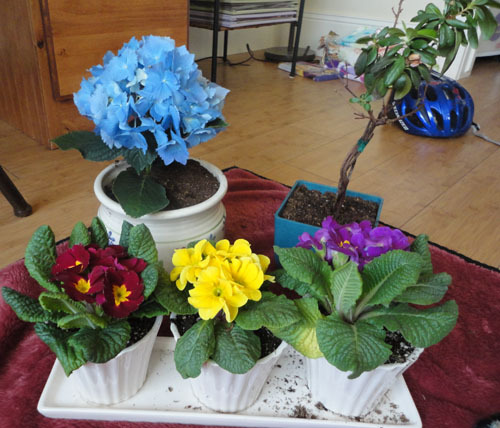 Any plants with colorful leaves and/or blossoming plants will need plenty of direct light to grow well. Humidity – Where I live in Southern Utah the air is VERY dry. Our average yearly humidity levels are around 30%, rarely getting over 70% throughout the entire year. One reason our idols from Hawaii can grow such beautiful plants is because of the high humidity (and even temperatures). Your houseplants will get a healthy boost towards survival if you place them in the bathroom or kitchen, the two most humid rooms in the house. 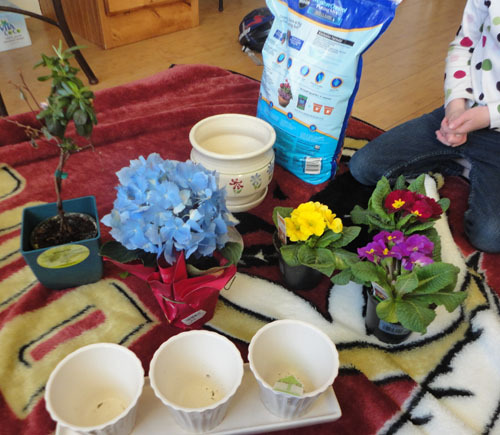 You can also place a humidifier in the room where your plants grow or place them in a tray filled with pebbles and water (making sure the pebbles keep the plant from sitting inside the water). Some plants, such as succulents do well with low humidity so save those types for rooms with a lower humidity level. Temperature – Houseplants typically need to live in temperatures between 65 and 75 degrees. These temperatures are HIGH for my house in the winter as I tend to keep my house at about 63. Luckily the rooms where my plants live are on the south side of the house near large windows so the temperature is a bit higher during the sunny afternoons! Water – This may arguably be the biggest reason people fail to succeed with indoor gardening. How easy it is to FORGET TO WATER!! (I have to set myself a reminder in my phone so I don’t forget) In addition to actually remembering to water it is important to understand how much water specific plants need. As a general rule MOST indoor plants should be watered thoroughly, allowing excess water to flow through the drainage holes into a catch plate. Remember, the catch plate shouldn’t be left with excessive amounts of water for the plant soil and roots to sit in. If you do give the plant enough water for the catch plate to become too full simply dump the excess water out. Allow the soil to become dry before watering again (in my house this takes about 3 days for most of my plants, if you live in an area with a higher humidity you will not have to water as frequently). I water my Orchid a little bit almost every day. Orchids do not like ‘wet feet’ but they also don’t like to become too dry. Dry climate plants such as succulents should be allowed to become dry and stay dry for a few days before watering again. Fertilizing- Less is typically more! I very rarely fertilize my indoor plants (perhaps I should more often) and they have stayed quite healthy. Grooming, and pest control – Use common sense. Pluck dead leaves and flowers. And use a mild pesticide (made for indoor plants) if you have a bug problem. Taking these simple gardening issues into consideration you are on your way to becoming a successful indoor gardener!